I am not well placed to forecast the outcome for Greece. My instinct remains that some form of deal will be cut, that will allow Syriza a chance to demonstrate whether it can undertake some positive reforms while remaining within the euro area. The run on the Greek banking system is the only thing that could derail a "muddling through" scenario. The odds appear to be rising of some form of capital controls being imposed. This could be a temporary measure, or it could create "Greek euros", which would become a de facto new currency. Although I think the reforms demanded by the Troika are economically insane, that does not mean that I think it is reasonable that Greece completely ignores the wishes of the Euro Group. The euro area is a group of sovereign nations, and the its institutions are going to reflect the will of the powerful nations within that grouping. It would be nice that the other euro area nations had good governments, but good economic governance is a relatively rare phenomenon. The only way for Greece to escape its fetters while staying within the euro area is for a multi-national anti-austerity coalition to be formed. That coalition does not yet exist. In "Greece and the Art of Liquidity", Neil Wilson discusses the mechanics of the Greek banking system. Using his analysis, one can see why it is reasonable not to panic immediately about Greece. The situation is that Greece can continue in its present institutional arrangements as long as the TARGET2 system contains Greece. If the Eurogroup's plan was to contain financial losses to other countries, their present strategy was the worst possible one to follow. They have induced a bank run within Greece, as deposits flee Greek banks for foreign ones. What happens in these transactions is that the Greek private sector gains a senior euro claim on foreign banks, while the flip side of the transaction is that the foreign governments gain a claim on the Greek government via the TARGET2 settlement system. If the Eurogroup "pushes" Greece out of the euro, they will have to eat the losses on their official lending. Their current policy is adding private Greek bank deposits to the pile of debts that are essentially non-collectable on any reasonable time frame. Such a policy might be implemented as a means to temporarily protect the Greek banking system during the negotiation process, or it could be the first step for Greece's permanent exit. UPDATE: Upon further reflection, the legal implications of a suspension of the TARGET2 system for Greece are interesting. "Greek euros" would still be euros, and since the definition of the euro is transnational, no other country has an (easy) legal means of objecting to this. There is no need to re-denominate Greek contracts etc., as they are already denominated in euros; all that will happen is that they will be paid by cheques (or whatever) drawn on Greek banks. Of course, Greek entities with euro loans outside of Greece would be stuffed, but that was always going to happen. Additionally, it seems possible for Greece to remain inside the EU (and get "external euros" as part of the agricultural programmes). The more I look at this, the more likely I think that the Eurogroup is going to fold. For fans of history, J.W. Mason's "The Idea was to Create a Modern Gold Standard" discusses the parallels between the euro and the Gold Standard. I take a a somewhat more detached view; the euro is a fiat currency, and continuous economic failure will eventually catch up to the supporters of economic orthodoxy. Fed officials do their best to publicly ignore the shenanigans in Europe. This is reasonable, as it still remains highly likely that some form of deal will be cut. As a result, they would be able to continue with their plans of hiking rates at a steady pace based on the falling Unemployment Rate. 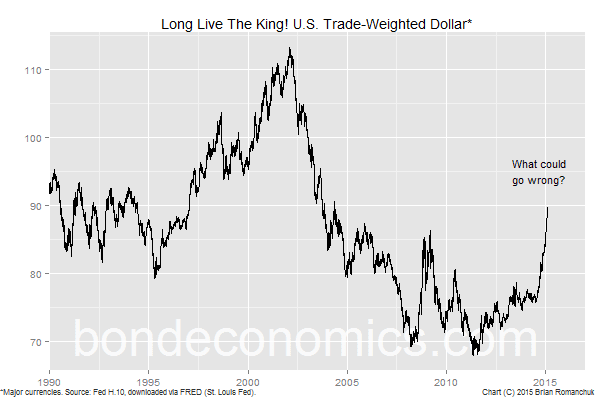 Although the trend in the U.S. dollar is due for a breather in the short term, the situation would get very interesting if the Fed Funds rate is pushed up to 2% when the rest of the world is experimenting with negative interest rates. American economists like to argue that the United States is a relatively closed economy, and so the Fed is free to hike rates and ignore what is happening elsewhere. This of course ignores the fact that the United States has a relatively large trade deficit, even if the gross flows are a smaller percentage of GDP than elsewhere. There are reasons why every Fed rate hike cycle ends in a financial crisis of some sort. This blindness towards the value of the currency is one of them. "The only loose end would be to cut Greece's capacity to print "international euro" notes and coins." That is fairly straightforward. The obverse of Greek Euro coins have a national pattern, and the Notes have 'Y' in the serial number. I've got a Greek 10 Euro note in my foreign change pot. You can always identify which country issued the Euro you have in your pocket. Good point. The question that I am unsure about is whether these marking are recognised in legal tender laws. Automatic machines may struggle of course. But that is part of the cost of the ECB deciding to press the nuclear button. In past posts, you have described government debt as "forward money". In his most recent post, Neil Wilson states "It helps if you realize that governments effectively spend bonds." "More on the Inter-Generational Implications of National Debt" , I write of government debt as macro-currency. I wonder if all three descriptions of government debt are based on the same principle: 'money is micro-economic currency and 'government debt is macro-economic currency' ? We can apply the distinction to the situation in Greece. The Greece government apparently has enough micro-economic money to pay government bills for a short time. Over a longer period, the Greek government does not have a balanced cash flow of micro-economic money. This situation will force the Greek government to seek to sell macro-economic debt to raise micro-economic money. How does the Greek government respond if it can not sell new Greek Government Bonds? If we explore this micro-macro-economic distinction, it seems to me that we would focus on who holds Greek bonds and where they domicile . Who would suffer if existing bonds defaulted and who would give micro-economic money to Greece after a Greek macro-economic debt default? I don't have answers here, only conceptions and alternative paths to understanding. The existing bonds were already defaulted upon; there are a few left in private hands, but Greek debt is now mainly held by euro area gov'ts and the IMF. What's at issue for Greece is the flows in the banking system. Deposits are flowing out of Greek banks. Additionally, they need to pay for imports, which implies emitting liabilities that foreigners will accept.